I don't know if you've noticed, but I tend not to buy very many stamping supplies. 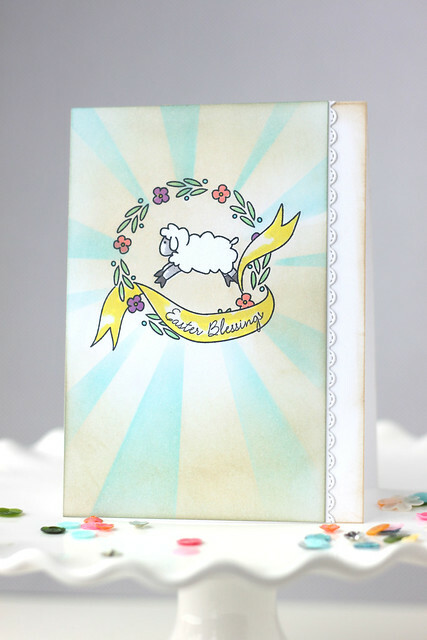 I'm lucky enough to design for Mama Elephant and Lawn fawn, and they make my favorite images. Once in awhile, though, a set comes along that I must have. 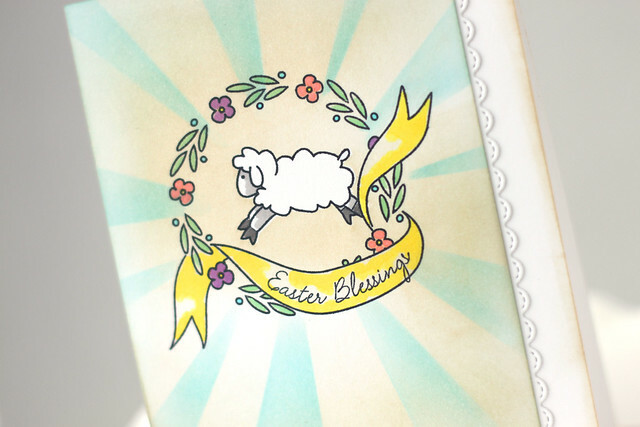 The new Wplus9 Easter Blessings set was one of them. I inked it up immediately after ripping open my package. I've been looking for a set for Easter that was cute, but that included more spiritual sentiments. I like the "easter blessings" and "rejoice" that are included, along with "happy easter." I created a mask around the images and inked up a sunburst stencil in beige and blue inks. I love that it all works to highlight the little lamb. Isn't he adorable? I'm also loving the new lawn fawn scallop borders. The stitching gives them an airy, dainty, lacy feel - perfect for springtime projects. This is simply adorable Elena, beautifully done! Pretty card. The sunburst background caught my eye. So sweet and that edge is just the perfect touch!